Charlton failed to put clear daylight between themselves and the relegation places as Reading held them to a nervous goalless draw at The Valley. Defender Talal El Karkouri came closest to scoring for Charlton when he thumped a header against the bar. Charlton's relegation rivals could have no complaints about Reading's appetite, with Ki-Hyeon Seol bringing a save from Scott Carson. Reading's Steve Hunt planted a late header wide as Charlton clung on. As Charlton sought their fourth successive home win the Valley crowd had been whipped into a frenzy by manic pre-match hype, including a Freddie Mercury look-alike. But Reading almost silenced the crowd in the opening minute when James Harper fed Leroy Lita inside the box and it needed a timely block from El Karkouri. El Karkouri was next in action at the other end where he thought he had given Charlton the lead. His thumping header from Darren Ambrose's free-kick crashed against the underside of the bar, but bounced the wrong side of the line for the Addicks. The pace was frenetic and Charlton's relegation rivals would have been pleased to see that Reading had not come along just for the ride. 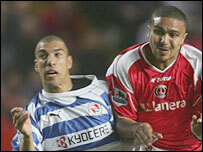 Charlton's Alexander Song was booked for a crude hack at Steve Sidwell who had broken away from the on-loan Arsenal midfielder. Reading provided Charlton with a reminder when Sidwell found Ki-Hyeon Seol in his own half and the Korean's weaving run took him to the edge of the box where his thumping left-foot shot was pawed away by Carson. The Royals asked further questions of the Charlton defence when Steve Hunt whipped in a cross which El Karkouri bravely won ahead of Lita. Charlton were forced to reshuffle twice in the first half, with Hermann Hreidarsson - who had been caught by team-mate Luke Young - and Marcus Bent limping off with injuries to be replaced by Ben Thatcher and Matt Holland. Nerves began to show in Charlton and Carson was forced to touch Sidwell's header over the bar to prevent it just dipping under the bar. Charlton's nerves were jangling at the start of the second half when El Karkouri fouled Lita 20 yards out, but the wall did its job, deflecting Nicky Shorey's free-kick away. Zheng Zhi tricked his way into the Reading box, but hesitation cost him as his shooting opportunity was quickly closed down, but minutes later he tested Marcus Hahnemann with a right-foot shot. Reading were beginning to turn the screw and Sidwell rounded off a neat passing move by driving a shot inches wide. Darren Bent looked an increasingly isolated figure as Charlton dropped deeper, but Hahnemann had to be alert to sprint out and clear as the Charlton striker chased down a through ball. Hunt had a golden chance to win it for Reading when Sidwell picked him out at the far post, but with time to bring the ball down, he planted a header wide from six yards. But right at the death, Zheng Zhi missed a similar headed chance to wrap up all three points for the Addicks. "We keep our unbeaten run going, it was a tough game, a clean sheet and that point might be important in the scheme of things. "We were disrupted by a couple of injuries, and I had to take Alexander Song off as he was booked. "I've never looked over my shoulder in my life, and I'm not going to start doing that now." "We have a responsibility to all the teams at the bottom, it was important for us to give a good show. "I look back on our competitive side and our spirit and I thought it was terrific, it was a fiery encounter, like a cup tie at times. "It's a good point in the circumstance, in view of their recent run of form, they looked a strong side." Charlton: Carson, Young, El Karkouri, Diawara, Hreidarsson (Thatcher 24), Ambrose, Zheng, Song Billong (Lisbie 69), Thomas, Darren Bent, Marcus Bent (Holland 30). Subs Not Used: Randolph, Rommedahl. Reading: Hahnemann, De la Cruz, Ingimarsson, Bikey, Shorey, Ki-Hyeon, Sidwell, Harper, Hunt, Long, Lita. Subs Not Used: Federici, Gunnarsson, Doyle, Oster, Kitson.